Brown sailed with the first party of Royal Engineers of Captain Parson's Detachment. They left Southampton on the La Plata on 2 September 1858 and arriving at Esquimalt on 29 October 1858. Brown appears to have been detached from Service at Derby and traveled with Colonel Moody, back to Victoria, as an orderly. "We have a Sapper now (while Richard is here) for an orderly, such a nice Man, a carpenter, he puts up shelves etc. He will do anything, just now when I went into the kitchen he was cooking the Fish for our tea and washes dishes and all sorts of unsoldierlike performances." As time passes, Brown becomes more useful to the Colonel. "...our orderly is a very useful member of our community, he will do anything, from sweeping the Kitchen , chopping wood, cooking, washing dishes etc., he is a carpenter and glues and mends etc. He goes up the River when Richard goes, and takes every care of him in everyway - cooks and does all for him and is most attentive." In early March of 1859, Moody travels up the Fraser. With him travel his new Secretary, Robert Burnaby, and Brown, now promoted to Corporal. "But stop, before I go further I must introduce to you our factotum and general manager, Corporal Brown of the Sappers, the handiest man and best servant ever seen. He keeps us all straight, makes our blankets, cooks, carpenters, mends clothes , and is always handy whenever you want him; you may think what a veneration we have for him. He is moreover slim and tall, upwards of 6 feet high, extremely handsome and very good tempered....We have capital grub cooked by Brown with the assistance of one of the Sappers." For some undiscovered reason, Brown was demoted to Sapper. "Everything is so dear here that I find it much cheaper to get groceries from Victoria and pay the freight up here then to buy them on the spot. We get better things too from Victoria. When Richard goes, he brings them up, and Brown is an excellent Shopper( the Soldier who goes as R's orderly). He knows all the Shops and gets the best things." 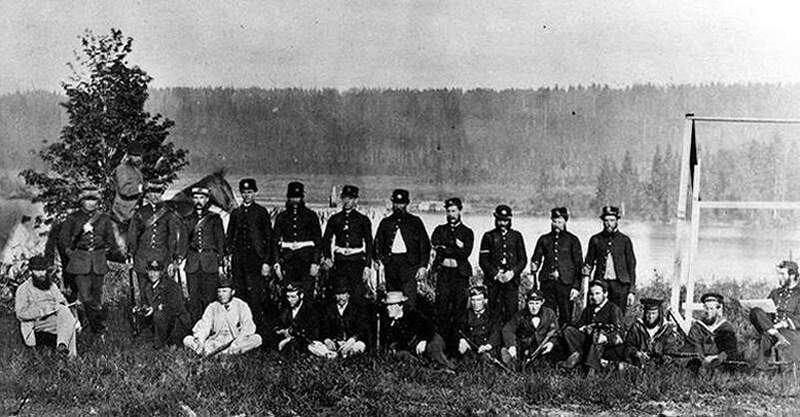 Brown remains in the Colony after the Detachment disbands in 1863. Brown, along with fellow Royal Engineer Sapper James Ellard, take over the ownership of a local saloon and advertise it in The British Columbian. to merit a share of the Public patronage. is everything that can be desired for a quiet game. New Westminster, October 30, 1863. 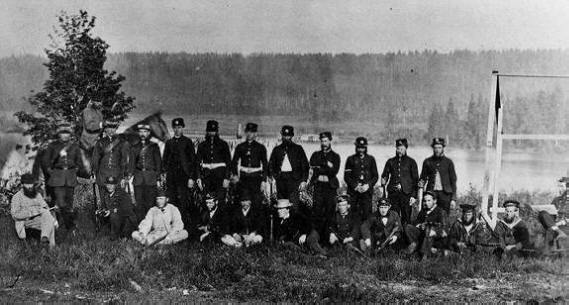 Brown joins the New Westminster Rifles and becomes a member of the Shooting team. Ensign A.T. Bushby (seated); Captain C.J. Prichard; Lt. A. N. Birch; Ensign R. Wolfenden (late RE); J. C. Brown (late RE); C. Good; I. Fisher; J. T. Scott; G. Williams (late RE); W. A. Franklin (late RE); J. Butler; Joseph Burr (great grandfather of actor Ramond Burr). Honorary Colonel, Governor Seymour (on horseback).